The Coulet-Darasse family welcome you to their 18th century farm whose activities have changed over time, culminating in its present use as a guesthouse. 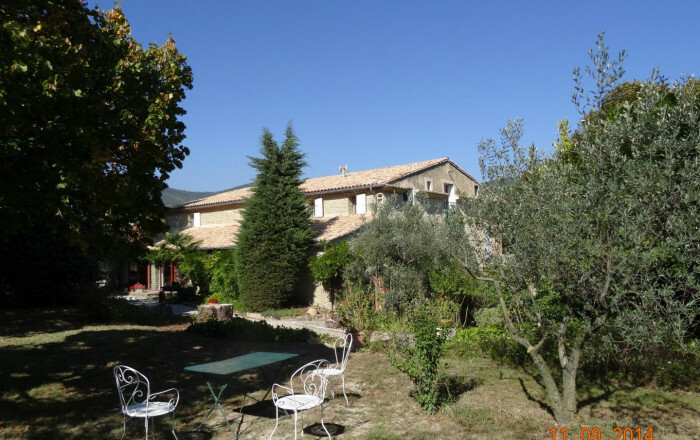 Enjoy an overnight stop or longer stay in the Mediterranean climate of Les Baronnies Provençales. Explore the architectural and gastronomic heritage of this lovely region: vineyards producing AOC Côtes-du-Rhône Villages & AOC Ventoux wines, Roman remains (old town, amphitheatre) at Vaison-la-Romaine (9km), Nyons known as Le Petit Nice (17km). Keen climbers will enjoy the Rocher du Saint-Julien at Buis-les-Baronnies (16km). Many walks/hikes and cycle trips (Mont Ventoux 40km). Local markets selling delicious produce. Peaceful setting on secluded 34 hectare property, set amidst vineyards and woodland. 5 nicely restored guest rooms with private facilities on upper floor (separate entrance). Les Pins (double bed, single bed, shower room, WC), Les Vignes (double bed, single bed, shower room, WC), Les Blés (double bed, single bed, shower room, WC), Le Murier (double bed, shower room, WC), L'Olivier (double bed, single bed, shower room, WC). Ground floor: shared summer kitchen (bring your own plates, glasses, cutlery, etc.). Shared salt water swimming pool (4x9m), sheltered from the Mistral (wind) with fine view of the Mont Ventoux. Bike shelter, shared garden.